Palouse Falls State Park, which is home to Palouse Falls, is located in LaCrosse, Washington, which is not a place most people have probably heard of. It's about halfway between Spokane and Kennewick in Eastern Washington, and it's pretty remote—the state park doesn’t have cell service, and it’s not on located near any popular or busy roads in the area. Even though it's pretty tucked away, if you make the trek, you’ll find it's a beautiful scene, highlighted by a pretty amazing waterfall. Make no mistake. Palouse Falls State Park is not filled with things to do, and it tops out at right around 100 acres, so it’s not huge. It’s remote and does not have a lot of facilities. There are no phones, and sometimes there is no staff on site. The purpose of visiting this park is to enjoy sheer natural beauty at its finest. First and foremost, you’ll see Palouse Falls. The Palouse River travels through a narrow cataract and falls 200 feet over a cliff into a stunningly beautiful circular pool surrounded by canyon walls. The scene looks like something straight out of a fantasy movie. The falls are the only ones left from an ancient Ice Age flood path, too, making them even more unique. While there isn’t a ton to do at this remote state park, there are a few ways to enjoy it. Hike the trails: While you might be tempted to hike in the park, stick to the trails. You’ll see plenty of people venturing off the official trails, but be aware that it’s entirely possible (as in, it’s happened to park visitors) for trails to crumble and for people who go off-trail to get hurt or fall into the water. There isn’t much in the area, so if you are tempted to go off trail, keep in mind that emergency responders are not nearby. Also, beware of rattlesnakes. Capture the beauty: Photographers, painters, and other artists enjoy Palouse Falls for its beauty. Park yourself on the trails above the falls, and let your creativity fly. There are a few viewpoints to enjoy the falls from, but make sure you stay on official trails. Learn about the park: History buffs can read informative plaques around the park about the Ice Age floods and how they formed this dramatic landscape. Camp in the park: Palouse Falls State Park is remote, but it does have some camping spots open on a first-come, first-served basis. Have a picnic: Bring along a picnic and kick back and enjoy the surrounds. The park has a few picnic tables where you can set up for lunch. Bird watchers and wildlife viewing is possible here too. The falls are a result of repeated glacial flooding about 13,000 years ago (called the Missoula Floods) that happened at the end of the last ice age. The floods happened after the ice dam ruptured several times in a row. After each rupture, the lake would flood down the Clark Fork River and the Columbia River, as well as flood a lot of Eastern Washington. The floods significantly changed the landscape, carving out the scablands in Eastern Washington and leaving behind Palouse Falls. Palouse Falls State Park was dedicated on June 3, 1951. And the falls were designated at Washington State’s state waterfall on March 18, 2014, by the state legislature. The bill designating the waterfall was written by students at nearby Washtucna School. 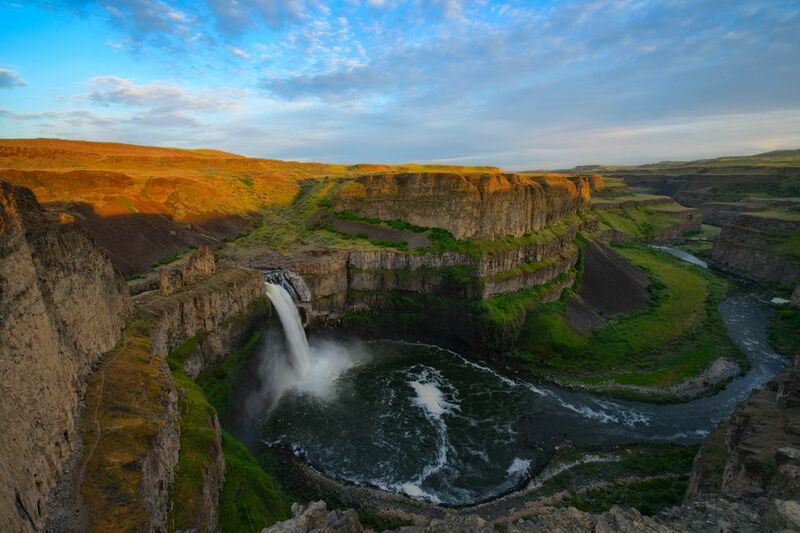 Palouse Falls State Park has a tent-only campground with 11 campsites and a pit toilet. Campsites are primitive, and only one is ADA accessible. Each site can have two tents and four people, and each has a picnic table and a fire pit. Drinking water is available from April to October only. To learn more about camping, call the park at 509-646-9218. Getting to this state park is just about the only bad thing about it. It’s not close to much, and the roads leading into the park can be rough. It’s not a bad idea to check the road conditions before you go. Depending where you’re coming from, you can approach the park from Ellensburg, Spokane, or other Eastern Washington cities. But the final steps involve getting onto WA-261. From there, follow signs for Palouse Falls State Park. The road winds through some hills for about 8.5 miles before you take a left (or a right, if you’re coming from the south) onto Palouse Falls Road. The road is well marked with a sign that says Palouse Falls State Park. From here, the road is dirt and gravel and can be pretty rough for 2.4 miles. When you reach the parking lot, make sure to put your Discover Pass on your dashboard. You will need a state Discover Pass to visit the park. If you don’t have one already, you can buy one at the park. Camping is $12 for a primitive site, $20-35 for a standard campsite depending on season, $25-40 for a site with partial utilities, and $30-45 for a site with full utilities.